Have you ever wished you could know what all of your readers thought about your content? Do you have a certain question for your readers? Of course you have and you are itching to discover what they are thinking about this or that. Fortunately enough, there is a plugin for that called Feedweb. 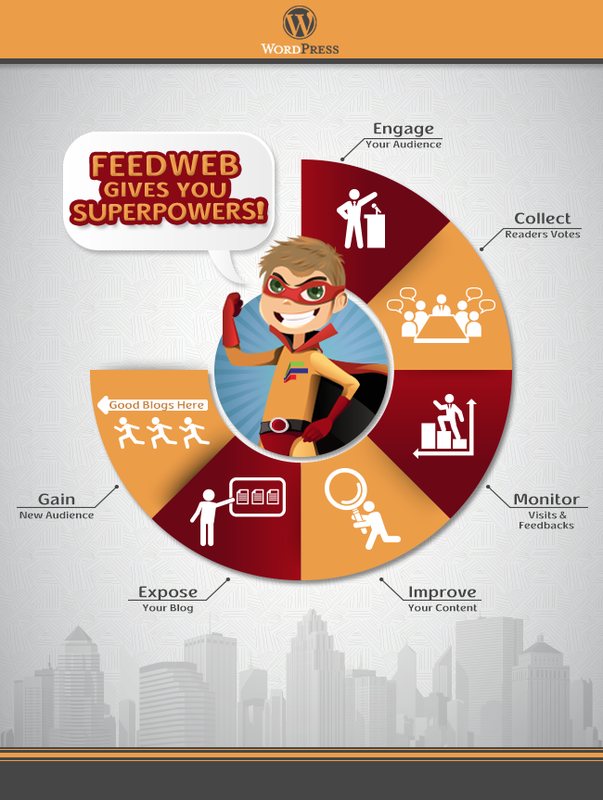 Feedweb is coined as a tool used for "audience engagement". Their belief is that by discovering what more readers think, the blogger or publisher will be able to better understand who the reader really is, and the opinions they hold. This knowledge is power to the blogger. So how does the Feedweb plugin work? The Widget: At the end of the posts you add one that by default will get a 1 - 5 rating from readers. Then you can go ahead and ask your binary questions. Why binary questions? Why do you need this if readers comment? First off, the majority of readers don't comment, so keep in mind that you have a large majority that you are not considering when taking in the feedback. The feedback process with Feedweb is simplified and the reader stays engaged if good questions are being asked. The Monitor: The Feedweb monitor is only in a beta version, but one can see that it is used to judge how well, over a certain period of time, the blogger has engaged his/her audience. The number of votes or answers that a post or author are getting needs to be compared to traffic and between categories, and so on in order to understand what readers enjoy the most. In this age of data, being able to analyze the degree to which readers have been engaged on the post in comparison to other posts, time periods, and authors can be quite helpful. Community Portal: The aggregator does not lose site of the big picture, and seeks to create a platform for readers to come and share feedback with one another without having to leave a comment. Anyone visiting the site can go through a handful of blogs in their channels: Tech, Biz, Media, World, Culture, Style, Family, Fun, Hobby, and Belief. Like many plugins and themes available for WordPress, Feedweb has a CSS style sheet option (for those that know how to use it) in order to edit the appearance of the widgets on the site. There are three available versions: Freemium, Plus, and Pro. You can get more info on the differences between them all by seeing the "License" tab once you have installed the plugin. All in all if you want to know more about what your readers think, this is a tool that you should try.